I have been watching cooking shows for years. My favorites are on a local station called WLIW and they actually teach techniques while they cook. Some of my favorites include Nick Stellino, Mary Ann Esposito and Lidia Bastianich. It is easy to veganize recipes by switching olive oil for butter, tofu for fish, chicken and seafood, tempeh for red meat, and simply leaving out the cheese. Miso is a great ingredeint to use in place of cheese in pesto like my red pepper pesto or for anchovies in pasta like in this Sicilian pasta. This is how my cooking style has evolved; think of dishes that I love or sound good in a recipe and switch or leave out the ingredients that are no longer in line with my beliefs. That is a long intro to these beans which I learned from Nick Stellino. They are fantastic and certainly my husband’s favorite. Set up the ice bath by filling a bowl with ice cubes and cold water. Bring a pot of water to boil. Cut off the ends of the green beans. 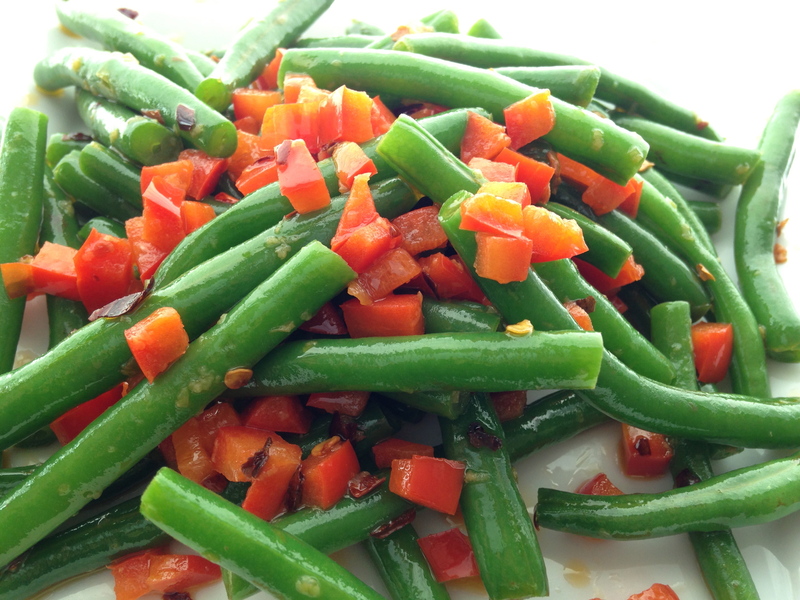 Cook the green beans in the boiling water for 3 minutes (exactly 3, set a timer) and drain immediately. Drop into the ice bath to stop the cooking. Lay the green beans onto a kitchen towel to dry. Cut the red pepper into a small dice and set aside. In a pan with sides, heat a few tablespoons of olive oil. Use your judgement, not too much but enough to coat the beans. Take the paper off the garlic clove and crush in a garlic press or rub over the top of a microplane right into the oil. If you don’t have either tool, mince the garlic and add it to the oil. Turn the heat on medium and cook the garlic. It will start to smell amazing and that is when you will add the green beans. Toss with the oil and garlic. Then add the red peppers. Toss again and season with salt and crushed red pepper, to taste. Yum. I learned this trick from a chef: If you salt the boiling or steaming water the beans (or other green veg) stay bright green.